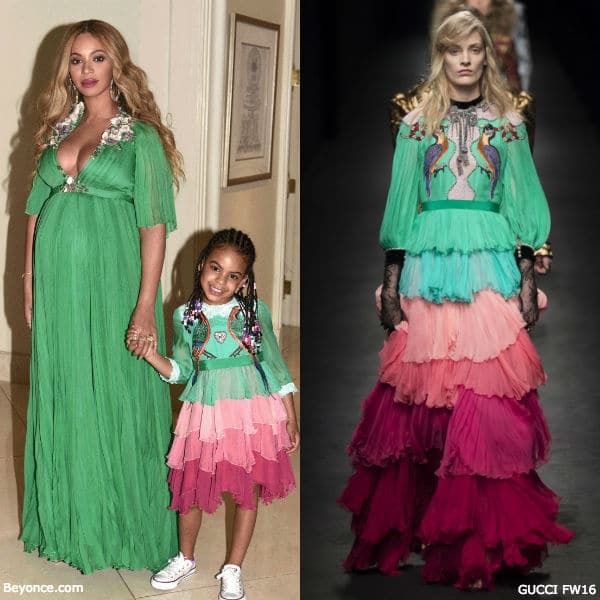 Beyoncé's daughter Blue Ivy wore this gorgeous Gucci Girls Mini Me Green & Pink Silk Dress at the at Beauty & The Beast Movie Premiere 2017. 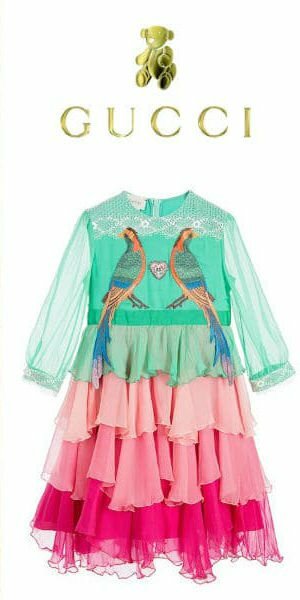 Made in Italy, this luxurious 100% silk chiffon green dress has a green and pink tiered skirt, embroidered birds appliqués with center embroidered heart appliqué with the designer's lucky number '25', white macramé details along the neckline and sleeves. Special touches include the mother of pearl interlocking G buttons and green grosgrain belt detail with bow at back. Blue Ivy completed the look with her favorite Converse Chuck Taylors and pink jeweled Gucci purse. 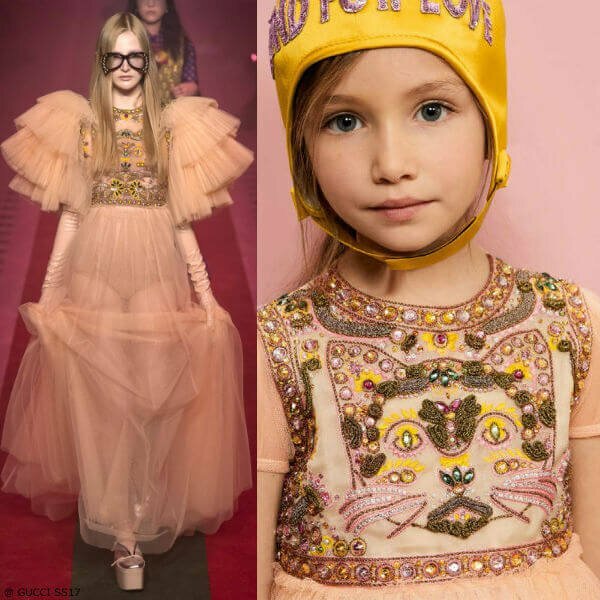 This gorgeous Green Pink Silk Gucci Mini Me Girls Dress is a pint size version of the Women's Gucci Velvet-trimmed embellished tiered silk-chiffon gown seen on the label's Fall 2016 runway show a Milan Fashion Week. 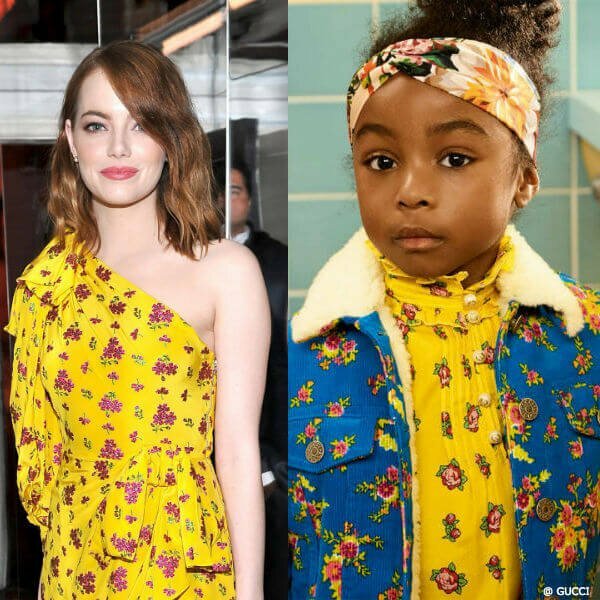 Designed by Gucci's creative director Alessandro Michele, this dress is a true heirloom piece crafted from ruffled tiers of plissé silk-chiffon that fade from jade to pink to plum at the hem. The lace-paneled bodice is ornately embroidered and embellished with parrots and snakes and dusted with glittering crystals and faux pearls.